Have you considered replacing hamburgers with turkey burgers but aren't sure if making this dietary change is really worth it? The good news is turkey burgers can provide you with numerous health and nutritional benefits. One key benefit of turkey burgers is the high protein content of this nutritious food. For example, a 3-ounce portion of 93 percent lean ground turkey patty provides you with about 22 grams of high quality protein. Turkey burgers are a source of complete protein, containing all the essential amino acids your body needs daily. Protein not only helps you feel full for longer periods, but it also allows you to maintain lean body mass and is beneficial for healthy weight management. Protein recommended dietary allowances daily (minimum requirements) are 46 grams for women and 56 grams for men. The number of calories turkey burgers provide depends on which type you choose. For example, 93 percent lean burgers contain 176 calories in each 3-ounce patty, and the same portion of a fat-free turkey burger provides just under 120 calories - but the same amount of protein. The higher the fat content of a turkey burger, the more calories it has. So, choosing low-fat or fat-free turkey burgers is beneficial for calorie control, healthy weight management, and weight loss. While fat in meats usually has a bad reputation of being unhealthy, saturated fat, the majority of fat in turkey burgers is poly- and monounsaturated, which is beneficial for heart health. For example, of the 10 grams of total fat in a 3-ounce 93 percent lean turkey burger, only 2.5 grams are from saturated fat. While it's still generally best to choose lean turkey burgers instead of those higher in fat to control calories, you don't have to worry about turkey burgers contributing to your risk for heart disease. Turkey burgers are carb-free, which is good news when you're trying to limit carbohydrates in your diet. Eating a turkey burger with a bun adds an additional 130 calories and provides you with about 22 grams of carbohydrates. 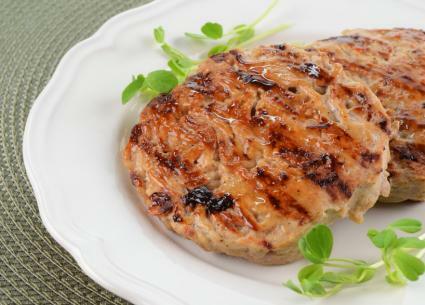 Another benefit of turkey burgers is the variety of vitamins and minerals they provide. This nutritious food is a good source of iron, zinc, phosphorous, magnesium, niacin, and vitamin B12. Lean turkey burgers are an excellent source of protein, vitamins, and minerals without the extra calories. Adding them to your meal plan will help you maintain lean muscle mass, boost satiety, keep heart disease risks low, and maintain a healthy body weight.